Travel Problems Happen, Don't Run Out! Pack light... carry-on only... that’s our mantra, right? OK, but pack enough medication when you travel. What's enough? What does that mean? ...being on holiday doesn't suspend medical reality. You need your pills, so pack enough medication in case you run into travel delays. ...so you don't need to worry about fitting them in one of those bags. So there is no need to skimp on what you may need. We have some tips on how to pack them. 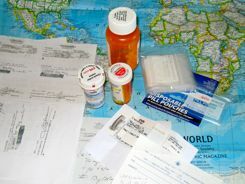 And remember.... medically necessary medications should ALWAYS be hand carried, never sent in your checked luggage. In the USA, the Transportation Security Administration says you may carry "reasonable quantities" of medications as long as you declare them at the security screening. OK, OK... so back to the advice to pack enough medication... begging the question... what is enough? We used to say we felt comfortable when we took enough medication for seven days longer than we intended to stay on our trip. Now I'm going to amend that to two weeks longer than we intend to stay. We recently voluntarily stayed an extra week in the Netherlands, and we just barely had enough pills. Most pills and medications don't take up that much room, so why take chances? We are always prepared to be delayed for a few days getting home partly because we do travel standby, but the point is, even if you have firm dates for getting home from your vacation, you should be prepared for the unexpected. You can wear the same clothes over and over again... and you can find places to eat if you get stuck somewhere, but you can't always replace medications if you're in an area that experiences flood or tsunami or hurricane or earthquake. ...Or winter storms that close airports. Seems like every year you see film of people sleeping in airports doesn't it? Can You Always Get It There? Our pack light mantra also says "if you forget it, you can probably get it there." But don't take a chance with important medications. ...but what if you get stranded out in the wilderness? Think that won't happen to you....? You don't go on wilderness vacations? Well, think about the tourists who were stranded in Machu Picchu Peru in early 2010. The flooding Urubamba River (also known as the Rio Vilcanota) washed out the train tracks. Those trains are the only way in and out of this UNESCO World Heritage Site ruins, so nearly two thousand tourists had to wait to be helicoptered out. This included "not-the-wilderness-type" tourists who had arrived on the luxurious "Hiram Bingham Orient Express" train and stayed in the posh Machu Picchu Sanctuary Lodge at the top of the hill. Aguas Calientes, the small town at the base of the Machu Picchu ruins, has tourist hotels and restaurants, but you might have trouble getting extra medication there. Those stranded tourists would have had one less thing to worry about if they had packed enough medication for a few extra days. A week worth of pills really doesn't take up too much room. 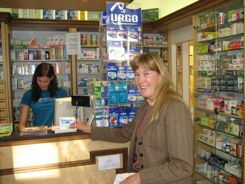 Even backpackers should pack enough medication.... You want to keep that pack light, but how much do those few extra pills weigh? And if you think about the hurricanes we've been seeing lately... tourists can get stranded even in paradise! ...but why take a chance with your health when there is such a simple precaution. And if you get stuck somewhere, you won't have to worry. You can just think of it as an adventure!